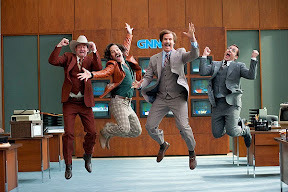 From announcing the follow-up film as Ron Burgundy on Conan to co-anchoring the news in North Dakota in character, Will Ferrell and company led a tireless advertising campaign to remind the legions of viewers that had been clamoring for a sequel to the cult favorite for years that they were back. Undeniably creative yet at times just plain obnoxious, as it turned out the aggressive ad campaign was a sneak preview of the very film they were plugging as Anchorman 2: The Legend Continues proved it is possible to have too much of a good thing. For despite the infinitely clever idea to make a tongue-in-cheek revisionist satire of the decline in journalism in the era of the 24 hour news cycle, Ferrell and the gang should have stopped after the first Ron. Thankfully the Blu-ray release of director Adam McKay’s unfocused, bloated misfire boasts a “super-sized R-rated version with 763 new jokes,” (including several that actually work better than the final cut that was distributed to theaters in time for the film’s Christmas release) so at least super fans can pick and choose which version and scenes they want to watch. Yet that’s an awful lot of work to expect from an average viewer who is most likely to be disappointed by the theatrical presentation. Ultimately Anchorman 2 amounts to a comedic car wreck that rather ironically (or fittingly, depending on your point-of-view) truly begins to go off the rails during an onscreen car crash that occurs as the result of a gag you see coming a mile away when the recently reunited news team of ego-driven airheads realizes that nobody is driving their RV. An all-out disappointment that’s a missed opportunity of epic proportions, Anchorman 2 tests your patience right from the start after relegating series MVP Christina Applegate to what amounts to a near walk-on role, McKay proves equally inept at handling new female cast members. Whether it’s in the tonally awkward performance of Meagan Good as Ron’s new African-American boss and love interest at the CNN-like Global News Network we find them working at in the 1980s to wasting Kristen Wiig as a female version of Steve Carell’s intellectually challenged, nonsense spouting Brick via a series of increasingly unfunny encounters, we wind up just feeling embarrassed Anchorman’s newest additions. 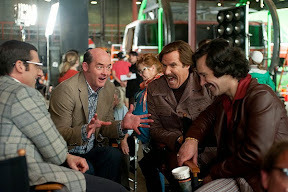 Likewise, despite a potential comedic goldmine given the new environment, screenwriters McKay and Ferrell wind up falling back on their old tried and true formulas we’ve seen throughout their oeuvre – borrowing plot points that worked better in previous pictures such as the character-building turning point that came from a medical trauma in Talladega Nights. Mixing the old with new takes on favorite moments from the first film like a supernatural tinged news network rumble in New York that runs out of gas by the time it’s done introducing all of its celebrity cameo players, everything in 2 is bigger except for the laughs. Likewise, it has that unmistakable Ocean's 12 and 13 like air about it that makes you think that it was infinitely more fun to make than it was to watch. By filling it with too many on the nose extreme references and crass jokes, the filmmakers have misgauged precisely what was funny about the first film. And while it’s possible that at least 25 minutes could’ve been trimmed from the movie to help match the pace established by the original, all in all it’s hard to guess how much of the work would actually be salvageable since there’s not enough good material upon which to build. 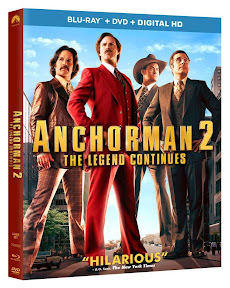 As such, this multi-disc set might just inspire fans to remix their own cut and given the vastly improved first act on display in the R-rated edition vs. the original, there might be a passable Anchorman sequel buried in there beneath all of the bulk. Unfortunately and despite all of the incredible talent involved (that may have spent too much time improvising than refining an already solid script), the one currently calling itself Anchorman 2 isn’t it. It’s too bad too given the satirical potential of our infotainment-based media and the messages contained in the film that roast the practices of various 24 hour news stations from Fox’s jingoism and speculative reporting to the rise of sensationalism of celebrity fueled stories and car chases in the fight for ratings. While the intriguing call-backs of age-old scandals from O.J. to Lorena Bobbitt earn chuckles, in an era where The Daily Show and Colbert Report cover the very same terrain with much more sophistication on a nightly basis, the lack of a sharper edge to the writing makes Ferrell and McKay’s gags seem halfhearted and dated at best. A true letdown that may have earned audience (and critical) goodwill due to how much we love those involved as well as the original film, while at least this multi-version Blu-ray, DVD and Ultraviolet combo pack offers up a more thorough presentation of what went wrong and what went right, I only wish that Anchorman 2 would’ve been filled with as much ingenuity as some of the stunts pulled to raise awareness of its theatrical release. In comedy, they say you should always leave your audience wanting more and because Anchorman 2 made me want less, in the end it proves that less is more – from the beautiful simplicity of the original to a shorter running time to the thought that regardless of demand, not every hit movie needs a sequel.